Long-serving DJ Justin Cudmore has put out releases on labels that have been affiliated with his DJing such as Interdimensional Transmissions and the Bunker. However, he now widens his gaze with this debut on Phonica's White offshoot. Like those previous Eps and his own DJing, the sound of Chicago and in particular acid, looms large here. 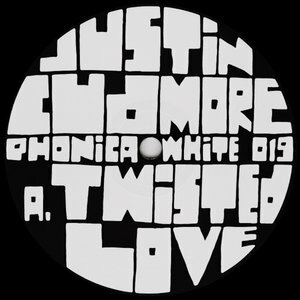 "Twisted Love" resounds to a rolling , drum-heavy backing, breathy vocal samples and some of the most tweaked, tripped out 303 lines known to humanity. On "About to Burst", the mood is not as intense, but Cudmore still manages to imbue the spiky, percussive arrangement with the type of wired acid action that will get spines tingling and pulses racing.